Maung Aw, one of Burma’s most senior and respected artists, spent 7 years learning his craft under the expert tutelage of a master artist – Saya U Thein Han, a teacher at The State School of Fine Art. Since then, Maung Aw has had numerous overseas exhibitions in Singapore, Hong Kong, Australia, U.S. and Shanghai. Maung Aw considers himself a colorist, above all else. 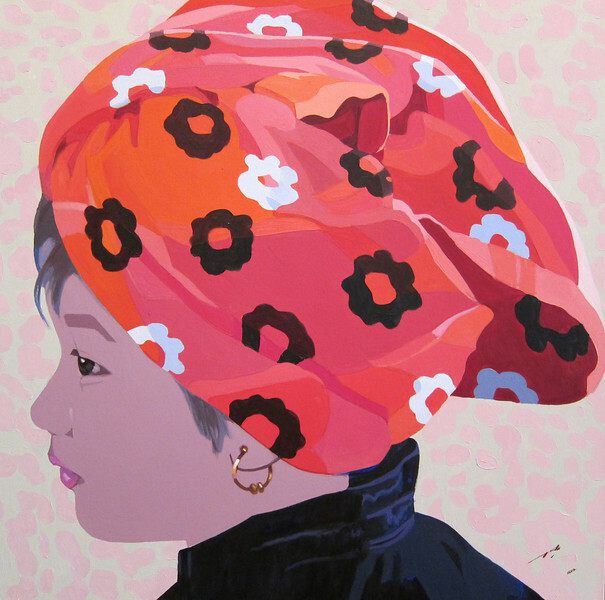 His current “Woman Dressing” and “Turban Kids” series are vehicles for the interplay between composition and color. He has stripped his paintings down to the most basic elements: one central character; bathed in shadow or light; with little or no shading or tone. He describes his works as combining shapes of color. Maung Aw says that as a young artist he enjoyed painting in a realistic style, exercising his skill to re-create realistic detail in landscapes and still lifes. But then he discovered Matisse’s philosophy of painting, which inspired him to change his style radically. He simplified his work, banishing details, stripping them down to their essentials. At this time, he first embarked on the Woman Dressing series. These works depict a Burmese woman in an everyday activity, re-tying her sarong-like skirt, called a longyi. Although common, this gesture is rarely seen in public; Burmese women are modest and try to avoid the eyes of strangers while performing this intimate task. But Maung Aw was inspired by the quiet beauty of this gesture, and wanted to use it as a central motif in his arrangement of colors and shapes. The genesis of the ‘Turban Kid’ series came from a trip to the Shan State where he encountered a group of Pa-O children, dressed in their finest clothes, watching a religious procession. He was moved by their bright innocent faces and the play of sunlight on their colourful turbans. As viewers of these simple yet masterly portraits, we cannot help but feel the artist’s delight as we look into the eyes of these charming children.